To live healthy is one of the best thing we need to do in life but the distraction of food generally won't permit us to live be conscious instead, we eat anything not taking our health into consideration. You can improve on your diet and live healthy with long life through the kind of food that enters the tummy. 1. Eat Less Food: To live healthy through diet, you need to learn how to eat less. I use to eat more until i get to the fullest which is bad, many people also eat more of snacks, meat pie, sausage etc. Junks food are sweet but bad for the body so, you need to reduce your intake of junks and food generally. Just eat normally and not excessively, you will be healthy if you do so. 2. Drink More Water: Water is good and also known as the basis of digestion, to live healthily, you need to drink more water and forgo sugary drinks, beer, alcohol, soft drinks. You can overcome this if your body need sugary drink and you bought a cold bottle of water instead. 3. Eat Fruits: You can also replace natural fruits with sugary fruit juice. There are many fruits such as apple, mango, cherry, pineapple, orange, carrot etc which can add more nutrients to the body than junks food or sugar. One of the best way to improve your heath is to cultivate the habit of eating fruit like taking one per day which is good for healthy life. 4. 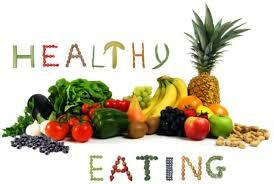 Eat Vegetables: You can replace snacks, carbohydrate, natural fruits etc with vegetables. There are different varieties of vegetables that exist and are edible. Just try and cultivate the habit of eating more vegetables which i believe aids digestion, add nutrients to the body and reduces fat. Vegetables is the best diet in the world that ensures good health so eat vegetables and live healthy. 5. Eat Grains: Grains such as rice, wheat, maize, soya beans, baked potatoes, sorghum, etc are god for the body because it give energy which are derived from carbohydrate. Some grains such as wheat also contains proteins which i believe are good for repair of worn out tissues in the body. 6. Take a Walk: Even after eating any kind of food, its healthier to take a walk just to ensure the food in your body get faster digestion process which may eliminate toxins in the body. Walking is a form of exercise that help lose weight but after eating, it makes lot of sense to walk around for the food to digest which also help burn some calories too. 7. Laugh: the best medicine is to laugh so as the doctors says. You need to make yourself laugh through watching comedies, dance, jokes etc. You can buy comedy films, short drama, cartoons and that's all. It keeps your nerves relaxed, improve your health system which is good. 8. Spend Time with Friends: You can improve your diet and stay healthy if you spend time with friends and see their eating habit. If you notice your friend has good shape, you can visit and study the eating habit of such friend just to learn few things from your friends. These are ways to ways to improve your diet and live healthy. Remember health is wealth which means we need to put diet into consideration on food that are healthy and fit for consumption for god health. Thanks for reading.